And Illidan stil stands crying in the corner. my opponent just used silence on my stormwind champion and im 99% sure the extra health wasnt removed from my minions. bug? Let's say you've got a 5/5 minion, he took 1 damage (5/4), then you put Stormwind Champion on the field, the first minion turn into 6/5, if Stormwind Champion dies or go silence the first minion goes back to 5/5, not 5/4. 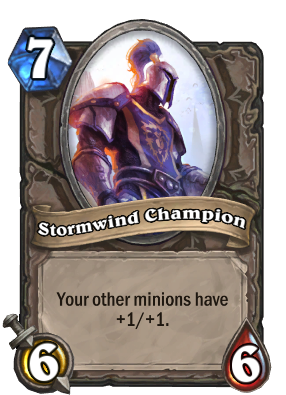 But if he is 5/5 not damaged then you put Stormwind Champion on the field, the first minion turn into 6/6, if Stormwind Champion dies or goes silence the first minion go back to 5/5. Does it mean this could remove fury from an enraged minion ? Yes, but only after the Stormwind Champion is destroyed. i love how meh this card is in constructed but it is almost a godsend in arena. It is super good for basic-only/low-budget decks.